A HUGE change will be revealed on Opening Night on Jan 20th! Don’t miss out! For 2016, Members will benefit from a few changes on the horizon for FACCOC. A special announcement will be made at our Opening Night Mixer to be held on January 20th at Arte Cafe in Cerritos. This big change will allow business owners to customize their membership to their networking style. This translates into more opportunities to accomplish your goals for 2016. We return back to our monthly routine of a Power Networking Lunch every last Thursday of each month at Dave and Busters. In this smaller, more intimate setting, this short format gets right down to what’s most important: sharing your business and learning about other members. Stop by and have lunch with us on January 28th. In February, we host our Annual Business Summit within the beautiful, artistic grounds of Bower’s Museum in Santa Ana. For this evening, we start with formal networking followed by speaker presentations that will provide members and guests useful tips and inspiration. 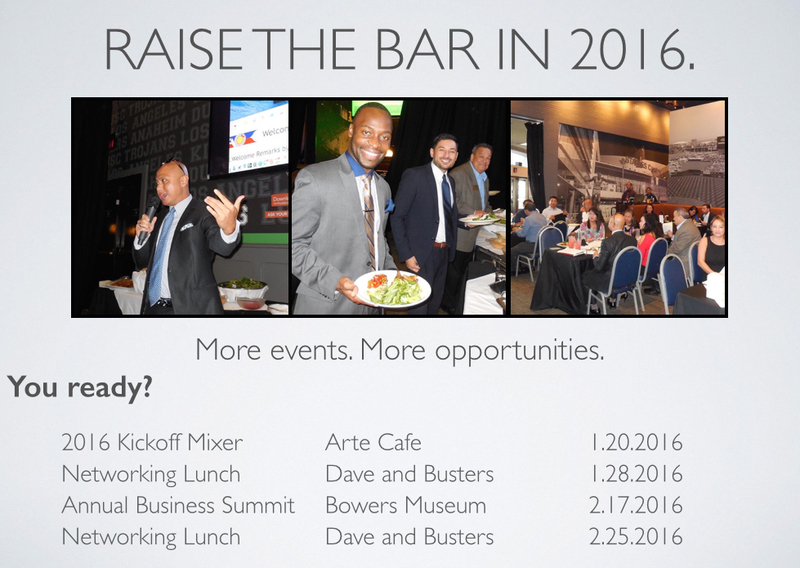 Our Power Lunch in February will be held on February 25th at Dave and Busters. Want to maximize your membership? Sign up to be a speaker at one of our events.